State and district authorities must encourage Obstetricians/ physicians from private sector to provide voluntary services at designated public health facilities. States must take special efforts to ensure that enough service providers are available in the high priority districts. They can also draw on support from donor partners for this activity. Profile- Create / View profile & define PMSMA facilities. Volunteer list – View list of volunteers registered in the district and call them within 24 hours of registration. Volunteer credit – Submission of Monthly data for each volunteer. PMSMA Monthly Report- Complete data report of PMSMA scheme including Govt. facility & Volunteers. Grievance- Reply to any grievance raised by any volunteer in your district. 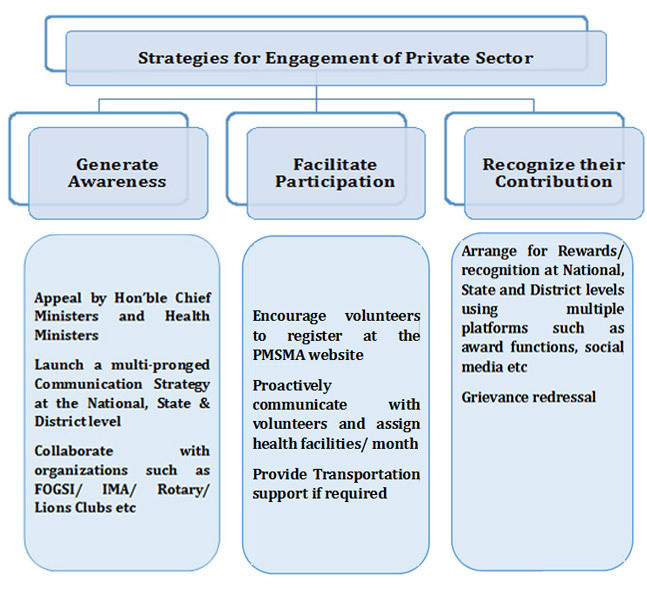 State level authorities can create their profile, view the district–wise list of volunteers’ registered, volunteer credit, PMSMA Monthly Report and Grievances.